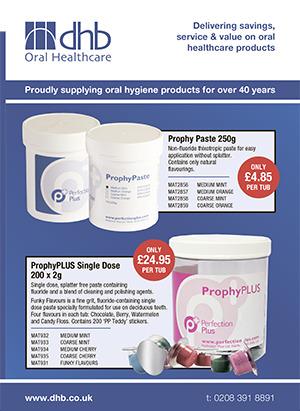 Over the past thirty years DHB Oral Healthcare Ltd has been a leading supplier of oral hygiene products to dental practices across the UK and Ireland. We are already supplying thousands of dental professionals with a vast range of products, including oral hygien, surgery and aesthetics. DHB is part of the Pharmaceuticals Direct Ltd group, which has expertise in pharmaceuticals and veterinary as well as dental products. Our strength lies in the fact that we are a specialist oral healthcare supplier and offer a full range of products including; Oral B, Colgate and GSK. We are also able to offer own brand products which are designed by dentists and give excellent quality without the premium price associated with a branded product. As a leading supplier of Oral B, Colgate, GSK and other branded products, combined with the purchasing expertise of Pharmaceuticals Direct Ltd, DHB is able to offer its customers the quality and range of products they require, as well as very competitive prices in a growing market. DHB is also committed to constantly improving its levels of service, having become the only national oral hygiene wholesaler to provide 100% dedicated telephone account managers thus giving us even greater market coverage and superior customer care. Your team advises patients to brush at least twice a day but how often do you brush?